People are finding Korean-American hip-hop artist Jay Park's attitude in life hilarious after continuously discovering random items in his old clothes that he had donated. Recently, online communities filled with laughter as buyers of Jay Park's old clothes at one charity bazaar began sharing pictures of the items they found in the clothes. It all started with one buyer who posted a picture and wrote, "I found a used-mask and gum wrapper in Jay Park's clothes." Following the first buyer, other buyers shared the items that they found in their purchases. Along with the pictures as a proof, one wrote, "I found a chocolate wrapper in his jeans and club wrist band in his cotton pants. ", and another one wrote, "Jay Park's hair was on the hat that I bought." The luckiest person out of all buyers was though, was a person who purchased Jay Park's hoodie. 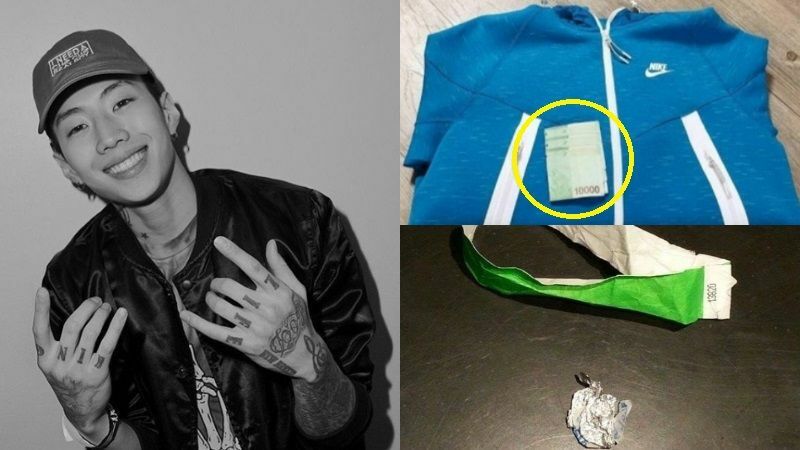 Apparently, there was 30,000 won (approximately 27 dollars) sitting quietly in the pocket of Jay Park's hoodie. Upon seeing these pictures, people left comments such as, "Are his old clothes all buy one get one random item free or something? ", "I can't believe he didn't even go through nor wash his clothes before donating them. He's so chill. ", "When you unexpectedly take a peak at your favorite star's life...LOL", and so on.